Recycling is picked up every other Wednesday. Set recycle carts out by 7:00 a.m. on the days noted on the calendar. Place recycle carts at the curb 3 feet from your trash cart. Please see the attached Recycling and Organics Guide for all items that can be recycled in the curbside single-sort recycle program and in the Blue Bag Organics program (organics picked up weekly with trash – see below for more information). 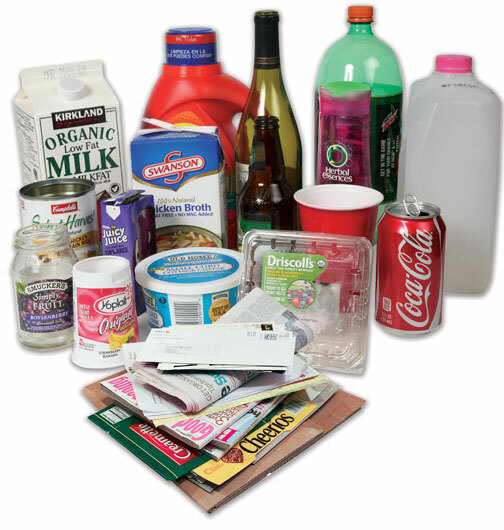 To set up your recycling and organics service or call for a missed pickup, contact Randy’s Environmental Services at 763-972-3335. The Blue Bag Organics Recycling service is available to all single family Medina residents at no additional fee. The fee is already included in your single-sort recycle fee and garbage service. To start service, all you need to do is call Randy’s Environmental Services at 763-972-3335 to set up the delivery of your year’s supply of compostable Blue Bags (choose between 13 gallon or 33 gallon) and a 32-gallon Blue Bag Organics can and lid are available if requested. The Blue Bag Organics food waste recycling system is an amazingly easy way to recycle kitchen scraps, discarded leftovers, spoiled produce, paper towels and paperboard take-out containers. This organics waste will be converted into nutrient-rich compost to fortify lawns, flower beds, and backyard and community gardens. What makes the program so affordable is that Randy’s Environmental Services picks up your Blue Bag Organics each week using the same truck they use to take away your regular household trash. That means one less truck will be traveling on your street. On trash day, please make sure your Blue Bag Organics liner is hand tied and placed in your regular garbage cart for curbside pickup (not your recycle cart). The blue bags are then separated at Randy’s Environmental Services’ facility. 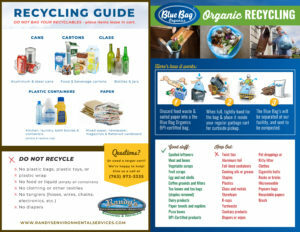 Print or save this Recycling and Organic Guide from Randy’s Environmental Services for easy reference. For more information on the Blue Bag Organics Program, please call Randy’s Environmental Services at 763-972-3335.